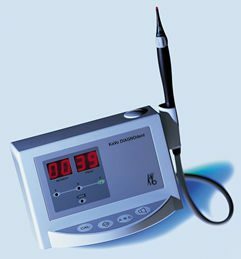 The KaVo Diagnodent laser cavity detector is a significant advancement and a unique development in the history of dentistry. Most cavities occur in the complex grooves of the chewing surfaces, making diagnosis with traditional methods difficult, because the outer tooth surface often appears to be intact. A laser diode provides pulsed light of a defined wave-length that is directed onto the tooth. When the light meets a change in tooth substance, it stimulates fluorescent light of a different wavelength. This is translated through the handpiece into an acoustic signal, and the wavelength is then evaluated by an appropriate electronic system in the KaVo Diagnodent control unit. The Diagnodent does have limitations, in that it can only be effective for a tooth that has no existing fillings. Additionally, the grooves of teeth must be clean and free of plaque and food for accurate readings.